Alfalfa is a strongly perennial plant which is able to live thirty years or more under favourable conditions. It has a typical taproot; that is, the root system consists of a strong main root from which secondary side roots branch off. As there are no runners or creeping roots, all the overground branches start from the uppermost part of the taproot which generally protrudes above the ground and is known as the crown. With increasing age, the crown is apt to split into two or more branches, the upper ends of which are free and form a kind of tuft, sometimes of considerable circumference. The main root, which when old is an inch or so thick and rather woody, finds its way down to a considerable depth if the soil permits. On the roots are found the nodules, typical of the leguminous plants. They are on the finer branches and are clustered together into irregular bunches. The stems, which in old plants are exceedingly numerous, are generally from two to three feet high at flowering time. As a rule, they are little branched, especially when the stand is dense. They are round below, more or less angular towards the top, and usually smooth. The leaves, which are alternate (that is, solitary at each joint and scattered along the stem), consist of three leaflets like those of Red Clover. The leaflets are rather narrow, two to three times as long as broad, and sharply toothed in their upper part. The middle one has a short stalk whereas in the cultivated species of Trifolium the central leaflet has no stalk. Occasionally leaves with four or five leaflets are found but not so often as in Red Clover. The flowers are in a short and somewhat one-sided cluster. Each cluster contains from ten to twenty purple flowers of the ordinary leguminous shape, as described on page 15. They are fertilized by means of insects, especially certain kinds of bees. In all leguminous plants fertilized in this way, the stamens may come into close contact with the body of the insect. A bumble bee, for instance, visits Alfalfa. The nectar being in the bottom of the flower, it has to poke its proboscis down to the bottom of the flower tube. When it comes in contact with the lower part of the blossom, it works like a touch on the trigger of a gun. The cluster of stamens is set like a spring, and the touch throws the upper part of stamens and pistil forward with a jerk. An insect sitting on the flower will thus be hit and his body powdered with pollen. When visiting another flower the same thing happens; the pistil comes in contact with the pollen on the body of the insect. The pistil is thus fertilized and more pollen is deposited on the insect. It is evident that cross-fertilization must frequently occur. As an insect will probably visit many flowers of a plant and travel from one plant to another, an individual may be fertilized by its own pollen as well as by pollen from another. Whether self- or cross-fertilization is most beneficial has, however, not yet been proved. Should a flower not be visited by any insect strong enough to open it, it will not be fertilized, not being able to explode by itself. The production of seed thus depends largely upon insects. The weather is also a factor, the flowers being almost insensible in cold, rainy weather, whereas in sunshine they will promptly respond to the slightest irritation. In common Red Clover the stamens and pistil gradually resume their original positions; as their elasticity is not affected by one or two visits, there is always a chance for proper fertilization. In Alfalfa there is no second chance; if an insect's first visit has no effect, the flower will not produce seed. After the pollen has been discharged, the pistil does not turn back to its original position; its top remains firmly appressed to the standard of the flower. It therefore develops into a curved fruit, although it is perfectly straight so long as it is enclosed within the flower. Its bending, which starts with the explosion of the flower, increases with its growth, and when the fruit is ripe it has the shape of a twisted shell. The home of Alfalfa is Asia, probably the southwestern parts. It has been grown in Persia from time immemorial and is perhaps the oldest forage plant in the world. It was highly esteemed as fodder for horses, its Persian name meaning horse fodder. From Persia it was brought to Greece about 500 B.C., whence it spread to Italy. It was introduced to western Europe by way of northern Africa. The Arabs carried the plant to Spain in the seventh century. From Spain it was introduced into France. It is now grown in all European countries except the most northern. It was introduced by the Spaniards into Mexico, whence it spread to the western United States and to South America, and by the English and other colonists to the eastern parts of North America. It is now cultivated all over the United States. In Canada it is confined to small areas, southern Ontario and southern Alberta being the two districts where it is grown extensively. Alfalfa is a Spanish version of the Arabian " Alfacfacah" which means "The best sort of fodder." Some have thought it to be derived from the Arabian "Al-chelfa," which means "That which grows after something else," and is generally applied to plants which thrive after the spring growth has disappeared. The latter name would signify the ability of the plant to grow during the hot summer and perhaps refer to its power of producing many crops during the season. The first-mentioned derivation, however, is probably the correct one, the Spanish "Alfalfa" having been identified with the Arabian "Alfacfacah" in the 15th century by Fray Pedro de Alcala, a prominent specialist on the Arabian language. A great many varieties of Alfalfa occur in the trade, some of which are real botanical varieties; that is, they can be distinguished by fixed botanical characteristics. Turkestan Alfalfa, for instance, has short, round leaflets and dull seeds. Others are only geographical varieties; their names merely signify that the seed has been grown in a certain country. Several, however, show decidedly practical qualities, such as hardiness, resistance to drought and disease, stooling power, seed production, etc. For Canada only hardy varieties are of importance. Arabian or Peruvian Alfalfa, for instance, will be winter-killed, and, generally speaking, varieties of a southern origin will suffer. When buying seed the farmer should therefore make sure that the variety offered him is suitable for the climate. It is always advisable to choose a variety grown in a country with a climate similar to that where the plant is to be grown. the roots penetrate to a considerable depth, the quality of the subsoil is of great importance. If it is compact and impenetrable it will be a serious obstacle to successful Alfalfa growing. For the same reason, there is little chance of a good stand on shallow soil on rock unless the roots can find their way through cracks. Alfalfa will stand a certain amount of alkali in the ground, but it should be leached out from the surface before the seed is sown, and afterwards should be kept from five to six feet below by irrigation. Acidity has always a detrimental influence. Where the soil is sour, an application of lime will prove beneficial. As the roots go deep, Alfalfa, although dwarfed in growth, is not seriously affected by severe drought. It likes a reasonable amount of moisture but is sensitive to an excess. If the subsoil is impervious, so that after a heavy rain the surface water cannot drain off rapidly, the accumulation will prove disastrous or will at least reduce the vitality of the plants. The soil must therefore be kept well drained, especially in early spring. In poorly drained fields, Alfalfa will be injured and sometimes killed in the low spots where water has accumulated. An excess of water in the ground will at least keep the plants back and prevent them from making an early start. Where the drainage is poor, alternate freezing and thawing does more harm than in well drained land as the heaving of the soil injures the root system. The strain is often so great that the taproot is ruptured and the plant dies. 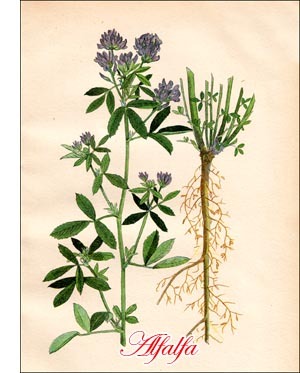 Like other leguminous plants, Alfalfa depends for its vigorous development on the bacteria in the nodules of the roots, which are closely related to, or perhaps identical with, those on Sweet Clover; it thrives well on soil where Sweet Clover has been grown. Alfalfa is generally sown in the spring. The young plants are delicate and succeed best where there is no competition. The land should therefore be as free as possible from weed seeds. As the plants are rather tender the first year, they should be given every chance to become as strong as possible to withstand the winter. It is therefore not advisable to cut or pasture Alfalfa the first season. During the second and following years the growth starts early and continues until late in the fall, new branches developing from the crown of the root. Under favourable conditions Alfalfa reaches a great age and gives large returns. The feeding value of Alfalfa was recognized in Persia long before the Christian era and it was highly esteemed by the Arabians. At present no fodder plant is known which can compete with it in nutritive value and general importance for feeding. It is relished by all kinds of stock, horses, cattle, sheep and hogs eating it with eagerness. Even Red Clover is inferior to it in nutritive value, the protein content being greater in Alfalfa. It can be fed to greatest advantage to dairy cattle but is also important for fattening all kinds of farm animals, especially sheep and hogs. Farmers sometimes say that Alfalfa does not make good hay, but such statements are usually the result of cutting at the wrong time. Its value for hay depends upon its nutritive value and its power of producing a number of crops in the season. As with most forage plants, the quality rapidly deteriorates after the plants have begun to blossom. The stems then lose their succulence, be-come hard and woody, and the leaves are apt to fall off. When the plants begin to form their blossoms, new secondary stems are developed from buds at the crown. As it is upon this secondary growth that the second cutting depends, the first cutting must be done before the secondary stems have grown tall enough to be cut off by the mower. For this reason it is advisable to cut a little earlier than the nutritive value and yield of the hay demand. If it is cut at the beginning of the flowering period, the yield of the first crop will be a little lessened, but the second growth will develop more quickly and the return will be greater. Early cutting gives a greater total crop of better hay than late cutting. Where the season is long and the weather favourable, five or six cuttings a year can be secured. In northern countries such as Canada, two or three cuttings a year may be expected. In irrigated districts or in places where haymaking time is dry, it is not difficult to cure Alfalfa into bright green hay of excellent quality. Where rains or heavy dews are frequent after cutting, the hay is apt to turn yellow or brown. Its nutritive value is considerably lessened and its palatability lost. Curing is generally done in the same way as for Red Clover. Alfalfa should, however, be handled more carefully, as the leaves easily fall off and their shattering causes a considerable loss of fodder. When Alfalfa is grown for pasture, which is only done to a limited extent in Canada, it is important to get the plants well established before turning the stock into the field. It is never advisable to pasture Alfalfa before the third year. Even in old fields care must be taken to prevent the plants being killed in spots. Alfalfa has a single taproot, the crown of which generally stands a little above ground. Being thus exposed, it might easily be injured by tramping, especially when the ground is soft from heavy rains. As the new stems come from the crown, Alfalfa is liable to be seriously damaged by close pasturing with sheep. It is not advisable to pasture late in the fall, as that would leave the crown exposed and apt to be winter-killed. Alfalfa can be sown with or without a nurse crop, according to the climate and the soil. In Ontario barley is generally used. Tests at the experimental farm at Indian Head, Sask., show that in the Prairie Provinces it is advisable to sow without any nurse crop, thus giving the plants the benefit of all the moisture in the ground. The amount of seed to be sown depends upon its quality and the soil, twenty to twenty-five pounds to the acre being considered a reasonable amount. Good stands are obtained by using a smaller amount of seed, but thick sowing will produce hay and pasture of finer quality.